Sshhhh! is a peculiar and fascinating look at love and life. 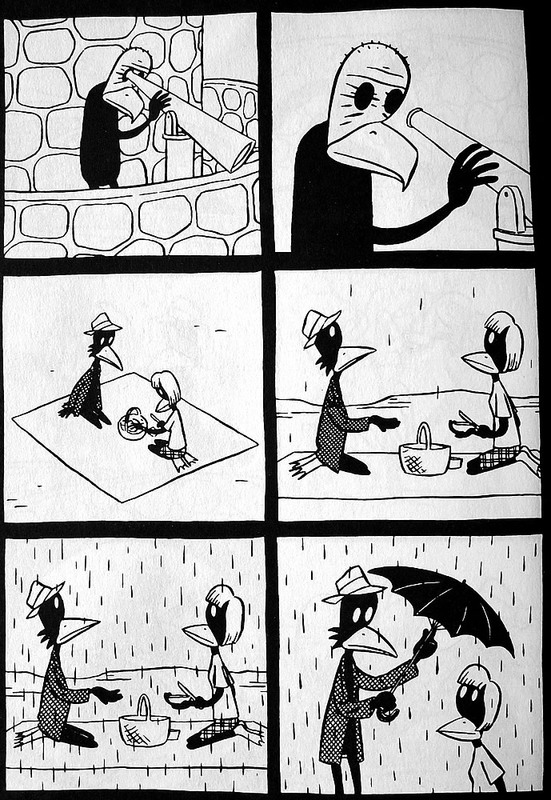 It is a wordless graphic novel starring an anthropomorphic crow in ten different chapters that might be a continuous story or just random episodes that happen to be compiled here. These stories range from romantic interludes that can be rather mundane but also fantastic, as the couples are beset by villainous vultures, space aliens, and other interlopers. Other episodes are more metaphysical, with the main character encountering personifications of death, the devil, and, in one instance, himself. The symbolic characteristics of these stories, which feature emotionless faces and characters devoid of affect, leave them widely open for interpretation. They are surreal, strange, and often disturbing, but they also sometimes resemble parables. Some of them are more substantive than others, but I think overall this book took me on a worthwhile roller-coaster ride of situations and emotions. 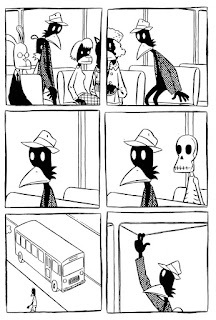 The prolific Jason is a Norwegian cartoonist who has won a number of awards, including the Inkpot, Harvey, Ignatz, and multiple Eisners. Among his many books are I Killed Hitler, Athos in America, Low Moon, Werewolves of Montpellier, and The Left Bank Gang. He speaks more about his various works in this interview. The reviews I have read about this book have praised its craft if not always its content. 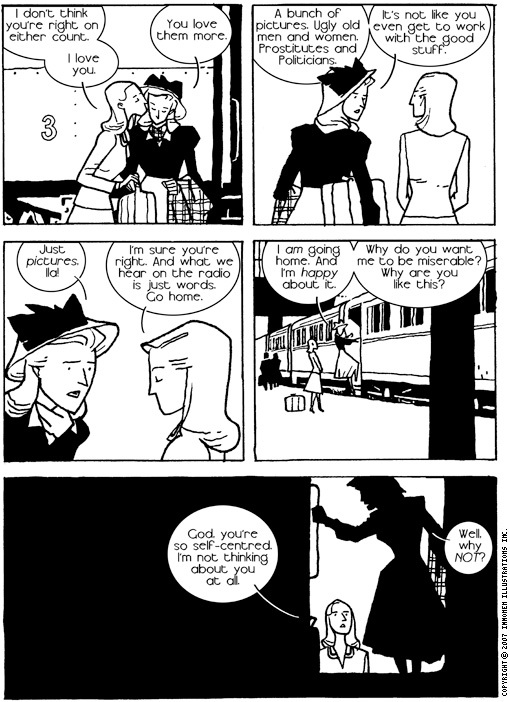 Parabasis called it "a delightful examination of love and loneliness." 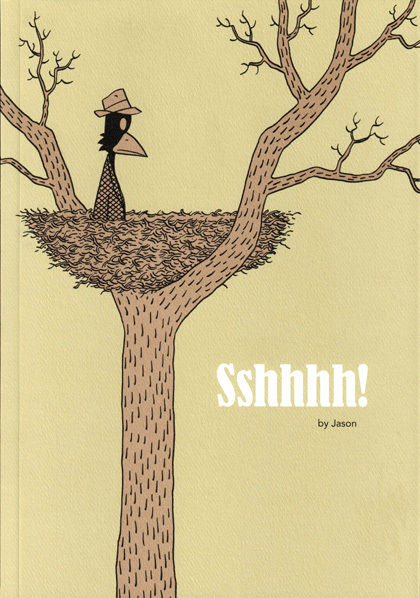 Jason Michelitch wrote that "Jason’s formal inventiveness is clever and at times breathtakingly elegant, but the...stories presented here don’t have the substance that his style seems to demand." Christian Perring took a more philosophical view of the book and concluded, "As an unusual illustration of core existentialist themes – hell is other people, we live and die alone, the contemplation of suicide – SSHHHH! works remarkably well." Sshhhh! 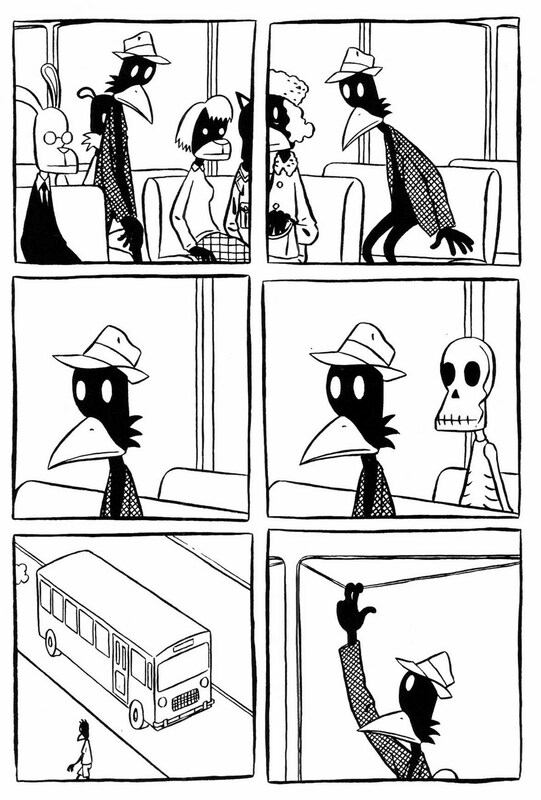 was published in the US by Fantagraphics, and they have a preview and much more here. Because of its adult themes, some sexual scenes, and some violence, I suggest it for more mature readers. Sshhhh! has also been adapted into a short film, which you can watch here. 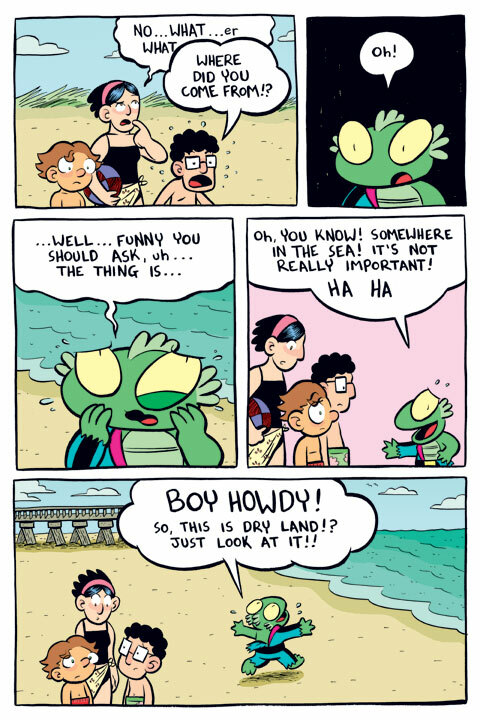 I don't want to spoil too much, but there is a whole lot of backstory that Mermin does not tell but the reader finds out little by little. He is a merman from the land of Mer, and he seems to be a figure of some importance, but something happened that made him want to abandon his underwater life. I felt that the story was compelling enough, and even though there is much left unresolved at the end of this book (it literally ends with questions) there are two more volumes (with a fourth soon to be published) for those who want to follow his adventures. 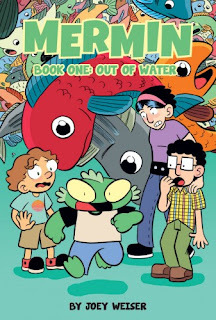 I know I felt a little disappointed that there was not more resolution in this book, but knowing there are more books that follow is good news for Mermin fans. 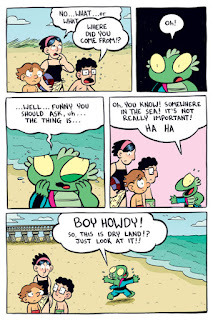 This book is the creation of Joey Weiser, a cartoonist who has published a few other books and mini-comics, including Tales of Unusual Circumstance, Cavemen in Space, and The Ride Home. He speaks more about his work on this book in this interview. The reviews I have read about this book range from positive to lukewarm. Diamond Bookshelf wrote,"The art is appropriately bold and cartoony, but also vibrant and easy to follow, and the coloring is very bright and eye catching." Publishers Weekly summed up, "The slapstick comedy, climactic battle scenes, and in-your-face cartooning add up to a story with the feel of an animated cartoon series, if not an especially ground-breaking one." Kirkus Reviews was not too enthusiastic about the book and suggested that "readers looking for a funny, bubble-gum comic with art vibrant as a Saturday-morning cartoon and action to match will find that this suffices." 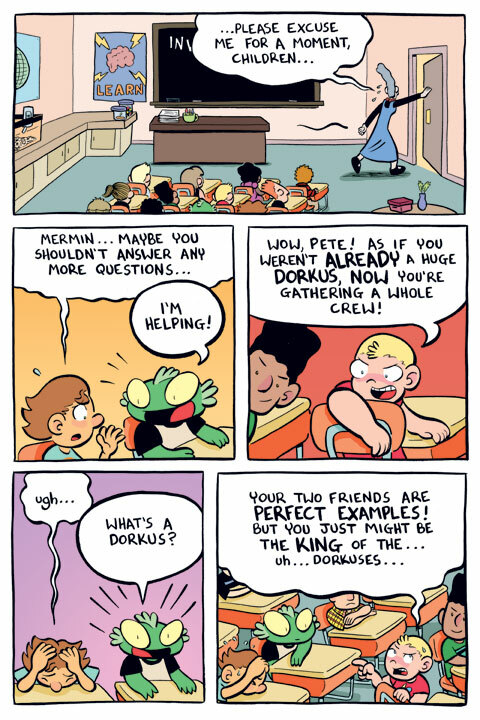 Mermin Book One was published by Oni Press. You can purchase it online here. Weiser provides a preview of it here. 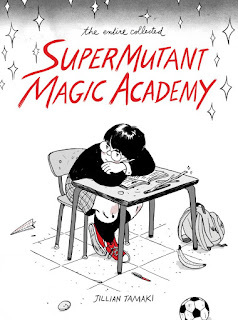 SuperMutant Magic Academy contains an interesting array of familiar and unique attributes. It is set in a sort of Hogwarts, where students who have many different kinds of skills and abilities attend. They have strong, distinctive personalities, and they often clash, bicker, cavort, commiserate, and chitchat, as many of the adolescent students I have known do. 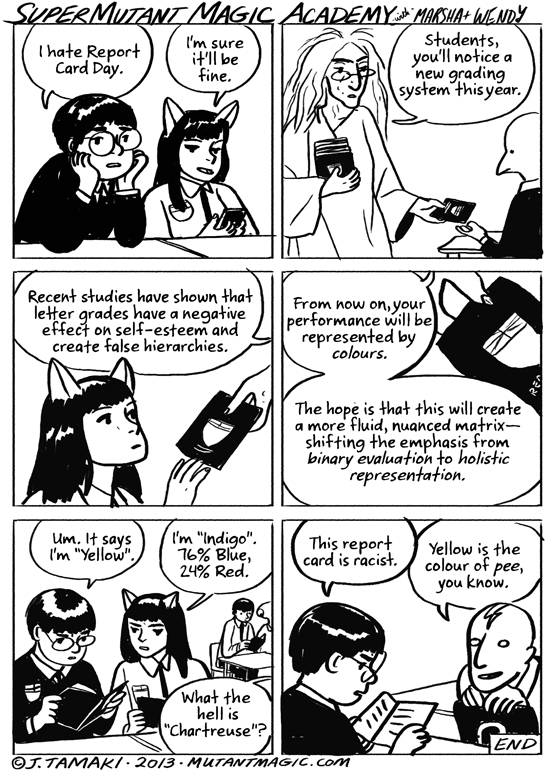 Although they are often arcane and fantastical, the students are also utterly realistic. All I can really say about all these episodes are that they are surreal, insightful, and more often than not hysterically funny. 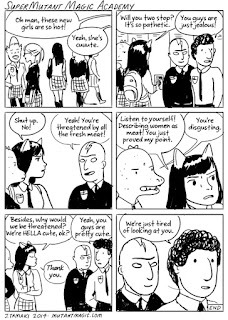 I know that this book is set in a total fantasy world, but these depictions of students seem more based in fact than fiction. At first I thought that this book was going to be pretty light and fluffy, but the more I read the more I realized it was an impressive and detailed piece of world building. 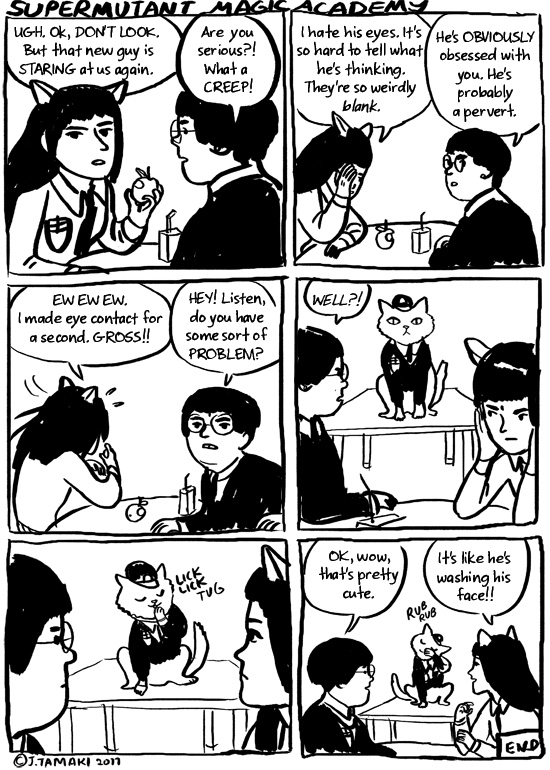 Writer/artist Jillian Tamaki is behind these antics. She is known for her collaborations with her cousin Mariko on the books Skim and This One Summer. She is a well established and celebrated artist, having received one of the highest distinctions for art in literature, the Caldecott Honor. 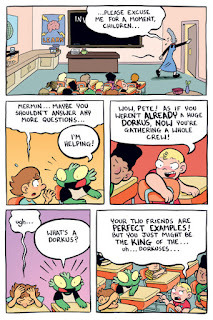 She speaks more about her work on this book in this interview with the Onion AV Club as well as this one with School Library Journal. All of the reviews I have read have been full of praise for this collection. 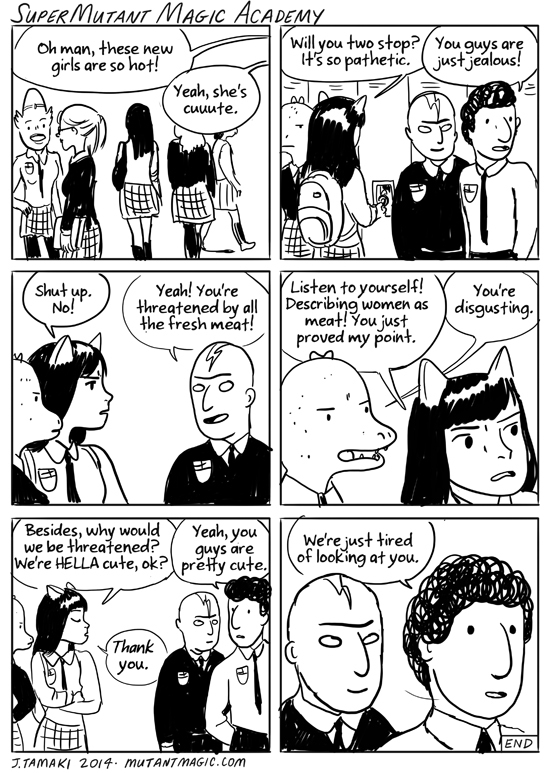 Rachel Cooke commented, "The majority of its strips are sassy, mordantly funny and feel true in ways that most other depictions of teenage angst simply don’t." 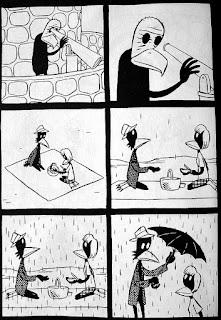 Etelka Lehoczky wrote that "each strip is an independent delight." Sean T. Collins simply called it "the best take on YA comics I’ve read in ages." 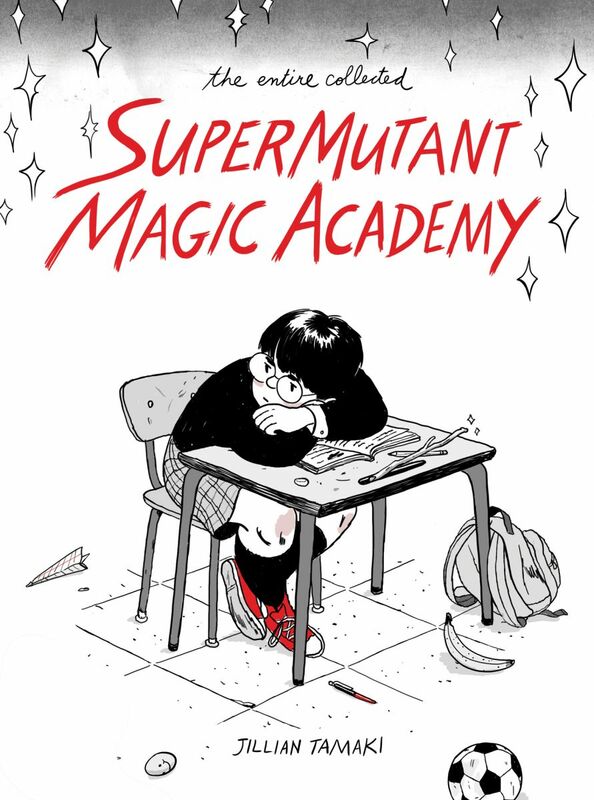 SuperMutant Magic Academy was published by Drawn & Quarterly. They provide a preview and much more here. 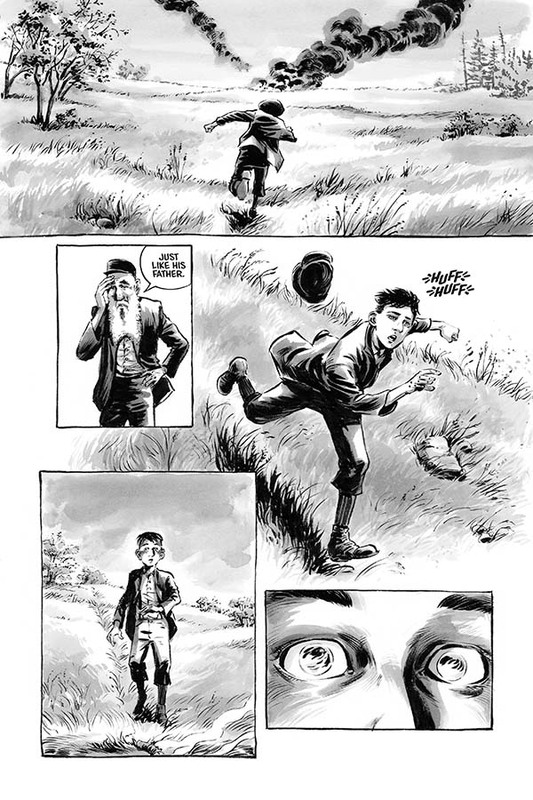 You can keep up with any news or updates about the book and webcomic here. The Divine was inspired by God's Army, a group of Burmese dissidents led by twin 12-year-old boys, but it takes that seed of truth and spins it into a much broader and fantastic fiction that still manages to comment on contemporary issues. The plot follows Mark, an ex-military explosives expert from the US who is stuck in a crappy job, with a baby on the way and pressure to move on to better conditions. He gets contacted by his friend Jason to be a contractor on a lucrative mining job in the fictional southeast Asia country Quanlom. Soon, he finds himself surrounded by conflict and he is moved by the plight of the country's inhabitants, particularly the children who are caught up in the violence. In this book, the dragons are both literal and figurative. 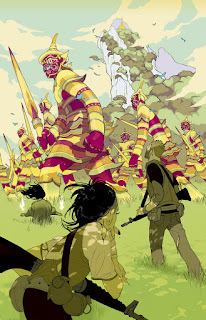 Mark is astounded when he finds that two of these young soldiers he befriends can summon gigantic warriors and also control powerful, destructive supernatural forces. 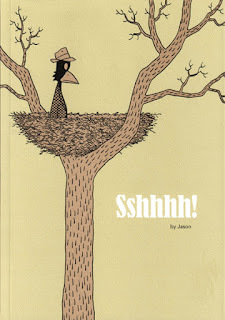 Jason is not so sympathetic, and much of this book is a debate/commentary on the nature of war and its consequences. Even though it is a work of fiction, it packs a powerful and realistic punch. There are a number of monsters in this book, and some of them are actually humans. In discussing this interesting, gripping, and provocative tale, I have not even gotten to what I feel is the strongest part of this book, the artwork. 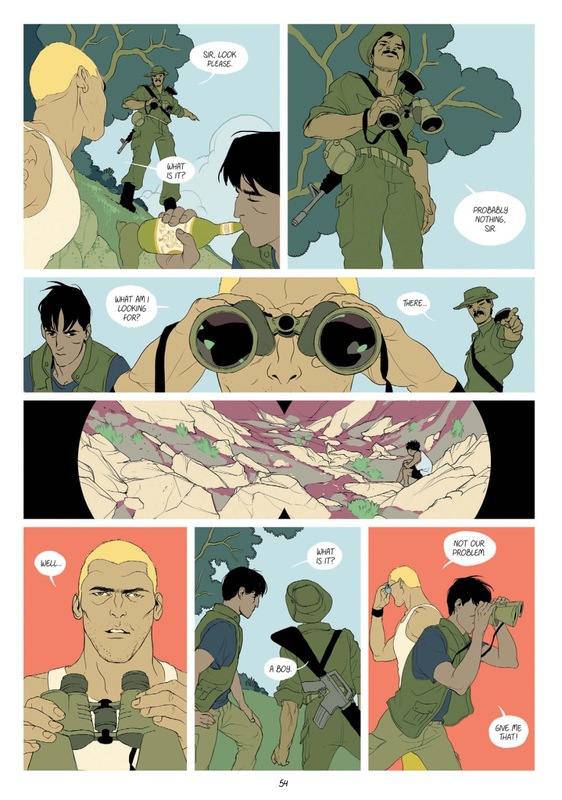 Brothers Asaf and Tomer Hanuka have hit a home run with their expert depictions of human moments, frenetic action sequences, and broad vistas that call to mind classic Asian landscape paintings. The pages ripple with action, and I love how the coloring is used to convey mood with foreboding reds, soothing greens, and murky browns. As you can see in the splash page below, the art is wondrous to drink in. 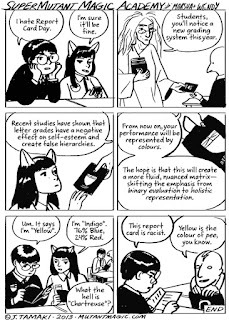 Asaf is also known for his work on The Realist webcomic, and both brothers have impressive portfolios of commercial art work for major media outlets. Writer and filmmaker Boaz Lavie has written for many venues, and he is also known for his short film, The Lake. This interview with all the creators casts more light on their work on this book. The reviews I have read of this book have been celebratory. Publishers Weekly called it "heady, hellacious, and phantasmagoric." Scott at the Open Book Society called it "one of the most perfect blends of word and pictures." Nathan Wilson called it "the latest installment in a catalog of award winning books." 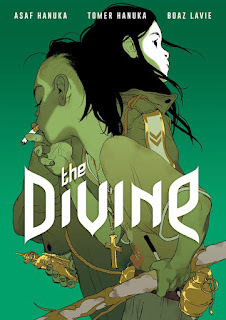 The Divine was published by First Second, and they have a preview and much more available here. Because of occasional swearing and a few scenes of graphic violence, I would recommend this book for readers mature enough to handle both. Breath of Bones is a collection of a three issue limited series. The story focuses on Noah, a young man who we see as a slightly older soldier in a framing sequence. The main narrative focuses on him and his family during World War II. They live in a small, rural village and they all fear the advances of the Nazi German forces. One day, the younger, able-bodied men, including Noah's dad, decide they must join in the defense of their country and assemble to join the larger army. The town is then left populated with women, children, and older people. All is quiet, but tense, until the day a plane crashes nearby. Inside is a British soldier, whom they rescue and give aid, but not far behind are Hitler's forces. Much fear is struck into the populace, and some want to send the British pilot away without sanctuary. Another debate arises whether to flee or to stay, hoping that either the Nazis don't show up or that they will not create conflict in the town. In the end, they do stay and the Nazis do show up. 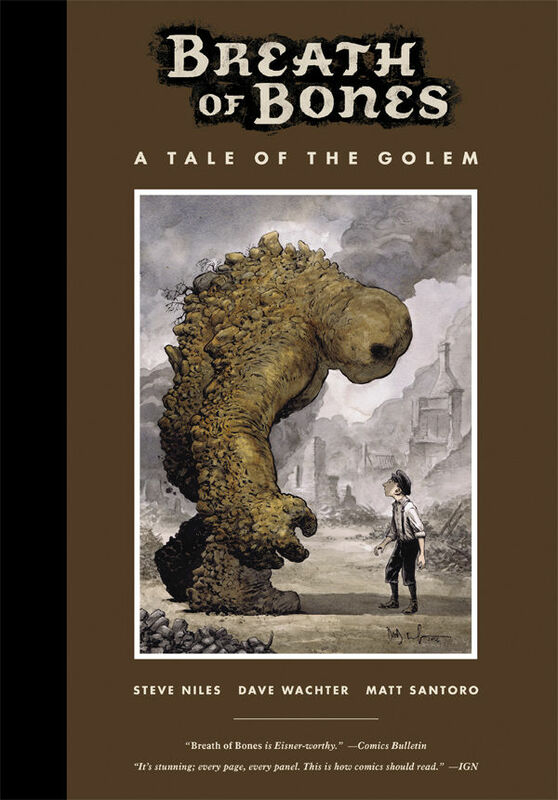 Noah's grandfather decides it's time he told his grandson some truths about his family and culture, and he is given the knowledge to create a golem to protect his people. What follows is a tale tinged with magic and hope in even the most dire circumstances. 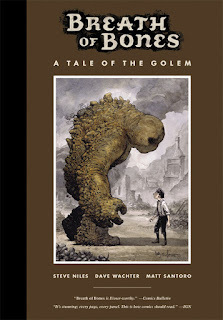 Most of the book is set in a time before the Nazis or the golem arrive, so there is a fair and good amount of character work, and I especially like how the relationship between Noah and his grandfather is developed. In the end, even though I appreciate the character work, I am not sure what I feel about the story. It is revisionist in its scope, not in a way that is so disrespectful or irreverent as something like Inglourious Basterds, but it is a piece of convenient wish fulfillment. The fictional drama here may be diminished in comparison to real accounts of Nazi occupation, and I am not sure I quite buy the magical realism within, but what is exceptional in this book is the artwork created by Dave Wachter. His characters are well defined and full of affect. His pacing and storytelling are excellent, and the larger page size of this collection really features his exquisite line work and watercolor shading. This book contains a beautiful display of visual artistry. The story in this book is by Steve Niles and Matt Santoro. Niles is known primarily as a horror writer, and his first major work was the comic book series 30 Days of Night, which was adapted into a major motion picture. Santoro is an actor, and as far as I can tell this is his only work in comics. Wachter has a number of comics credits, but is probably best known for the series Scar Tissue and The Guns of Shadow Valley. 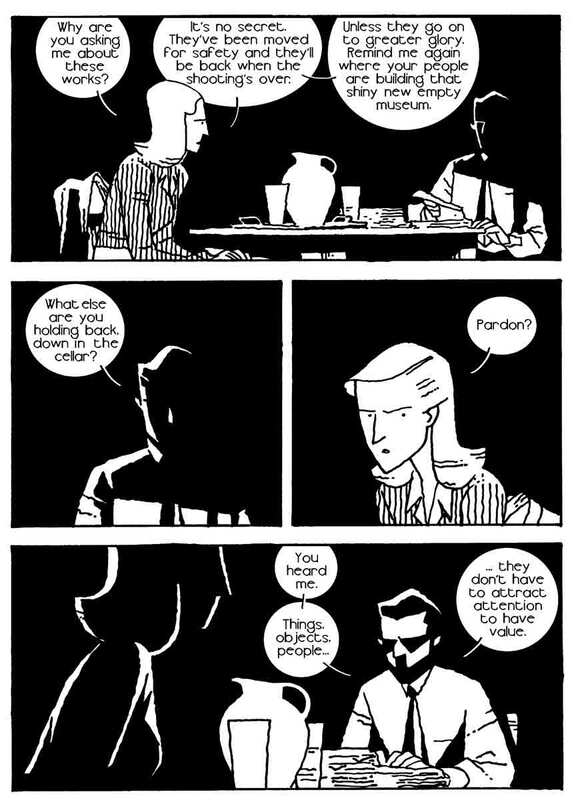 Niles and Wachter speak about their work on this book in this interview. This series was well received, and it has been picked up as a property for development into a movie. The reviews about it I have read have been mostly celebratory. Gary Makries called it "amazing" and stated that he "cannot recommend this enough." 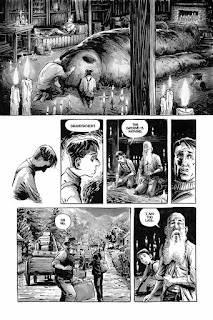 Gregory Paul Silber was very impressed with the artwork, but in the end was disappointed by some story details, finding it "a bit problematic that there is not a single mention of Jews or Judaism throughout the story" and also troubled that no specific geographic setting is named. 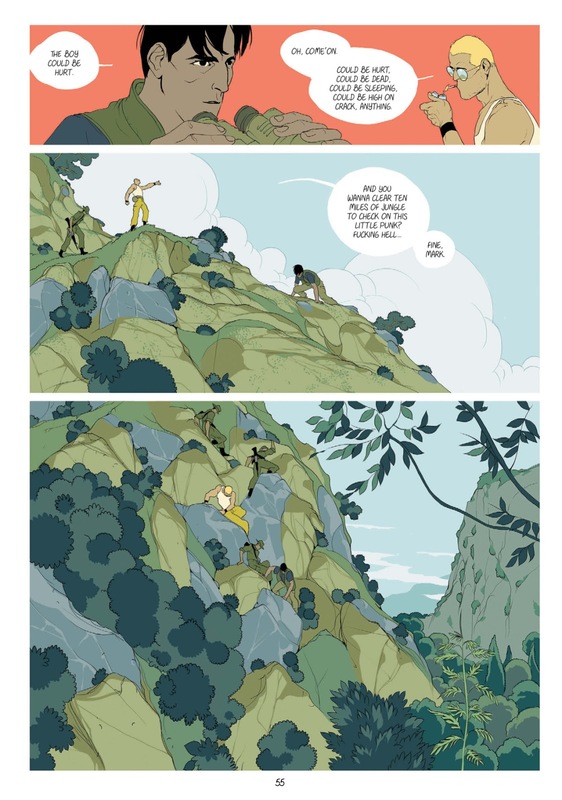 Kimberly summed up that if you are "a fan of great artwork and great storytelling, you cannot go wrong with Breath of Bones." Breath of Bones was published by Dark Horse, and they provide a preview and more here. Moving Pictures is an apt title for this book for two reasons, neither of which has to do with movies. It is about the effort of French museum workers to hide and protect great works of art (some are "moving pictures") from the Nazi occupation during World War II. This book follows the exploits of the curator Ila Gardner, a Canadian woman who decided to stay in Paris, where she is in charge of "third rate" works at the Louvre. The main narrative involves her being interrogated by Rolf Hauptman, a Nazi officer in charge of tracking down and cataloging great works of art. To say that their discussions are politically charged is an understatement, but matters are further complicated because they also have some version of a romantic relationship. Ila has many methods to stand up for herself and also defend an important part of civilization against an overpowering enemy, and over the course of the book she proves quite resourceful. However, Hauptmann is not a two-dimensional villain nor a pushover himself, and the study of these two characters as they joust is fascinating. As you can see, the art is relatively clean and simple yet complex. There is an excellent interplay between lights and darks that obscure people's faces at times but also set great atmosphere. Also, characters and settings are defined through negative space, which further abstracts the events of the book in a way that adds import and layers of meaning. The reader's job is to fill in those spaces, a task which is aided by copious flashbacks to various scenes from Ila's life. This book is intelligent, complex, non-chronological, and deals with some very serious subject matter. I found it very rewarding to read and re-read, but I feel because of its subject matter and presentation, it is best suited for mature, capable readers. 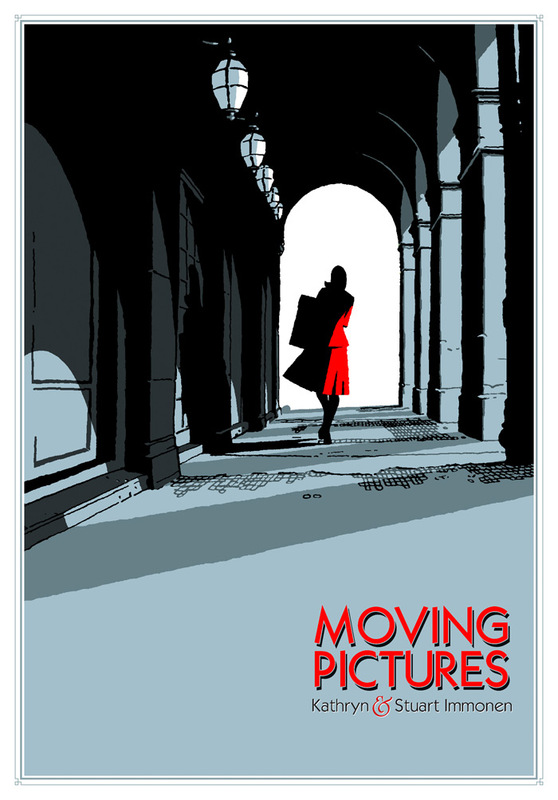 Moving Pictures is a collaboration between Kathryn and Stuart Immonen, a wife and husband who have worked on many comics over the years. Kathryn has also written multiple series for Marvel Comics, most notably Patsy Walker: Hellcat and Journey into Mystery. The Joe Shuster Award winning Stuart has drawn multiple series for both major comics companies and is the artist for the latest batch of Star Wars comic books. They speak more extensively about their work on Moving Pictures in this interview and also this one. 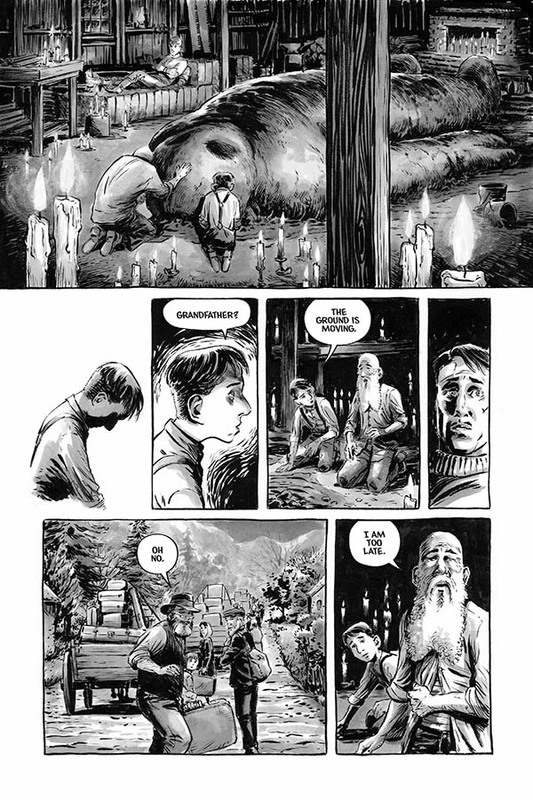 This book has received its share of praise and was nominated for the Stumptown and the Doug Wright Awards. Publishers Weekly gave it a starred review and wrote that "the Immonens keep the story spare and focused to allow the ambiguity of survival itself to become the drama." Rich Johnston wrote that there is "an energy on the page making the pictures work just as hard as the words." Seth T. Hahne called it "a fantastic little book." Moving Pictures was published by Top Shelf Productions, and they have a preview and much more information about the book here.